Could You Have Bed Bugs? What to Know. Could You Have Bed Bugs? Bed bugs. You can’t live with them and you definitely want to live without them. 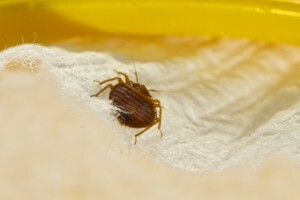 If you’re seeing evidence of bed bugs, it’s time to call in a NJ pest control service. Bed bugs aren’t a new species that has just evolved. These blood-sucking insects have been around for over 3,500 years. To put it into perspective, these tiny bugs have been found in the tombs of the Egyptians. The most obvious sign is the bites that appear overnight. They are itchy and usually look like a welt. Other signs include small dark stains on bed linens. The baby bed bugs, called nymphs, can be seen as well as the adults by the naked eye. Also, look around cracks and crevices, around and under mattresses, inside drawers, and in the laundry. Any dark, dry location. For bites, apply topical creams. If bites become infected, seek medical attention for antibiotics or corticosteroids for those with allergic reactions. Antihistamines also help relieve allergic symptoms. Whether home or business, call a professional pest control company to eliminate the problem. Our NJ pest control technicians know what to do about a bed bug infestation and have the treatments to take care of them. If you’re experiencing a bed bug infestation or concerned you might have them in your home, contact Stern Environmental for a free inspection.